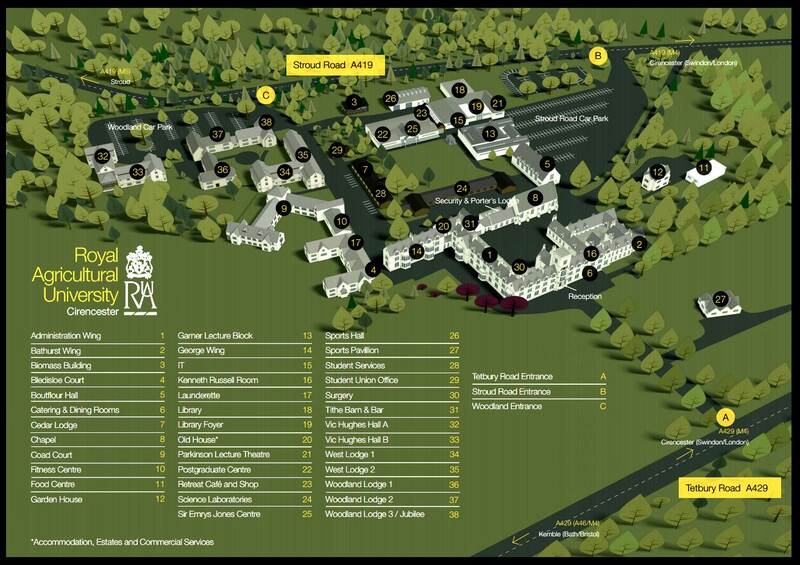 Here are a few of the questions we get asked most frequently about accommodation at the RAU. How do I decide which type of room I would like? Look at your budget, you will see that there are a variety of room types available at the RAU at different costs; you will need to choose a room that is affordable for you. Have a think about whether you would be happy sharing your toilet and showering facilities or whether you would prefer your own en-suite bathroom. If you would like to share a bedroom with another student, we do have a limited number of twin rooms available. We endeavour to offer all first-year undergraduate students accommodation on campus; however, we cannot guarantee this. Accommodation applications are dealt with on a first come, first served basis so it is vital that you apply for accommodation online via My RAU at the earliest possible opportunity.We have a limited number of rooms in a quiet block on campus and, whilst there is not such a strong demand for these, they are also dealt with on a first come, first served basis. If you are not allocated accommodation on campus, the accommodation office will support you in finding alternative accommodation in Cirencester or the surrounding villages. My RAU will ask you to list the room types on offer in order of your preference; you then have the opportunity to choose your catering type. Every effort is made to allocate you your first choice of room type (taking into consideration your preferred halls of residence); however as the forms are dealt with on a first come, first served basis, if all of the rooms are allocated, you will be allocated your second choice and so on. How much do I have to pay to secure a room in halls of residence? A non-refundable pre-payment of £200 will be required to confirm your application which will be deducted from the annual accommodation fees due. Will I lose my pre-payment fee if I decide not to come to the RAU? The pre-payment will be non-refundable in the event of withdrawal from a place at the university. However, if the place is still conditional and conditions of the offer are not met, the pre-payment will be refunded. How much will it cost to live in halls of residence? Please have a look at the accommodation charges. Most of our accommodation is catered so the outgoings you will need to budget for will include payment of toiletries, travel, clothes laundering, etc. UK and EU students can pay in instalments, termly in advance. International students will be required to make payment upfront and it is advised that this payment is made prior to their travel to the Royal Agricultural University. How many weeks of the academic year will I have to pay for? The majority of our accommodation contracts are from (and including) 22 September 2019 to (and including) 7 June 2020. For catered accommodation, you will have 4 weeks over the Christmas period and 4 weeks at Easter when the full catering facilities associated with residency are not available and therefore no meal plan charges are made. There are some rooms in the Main Building which are available during term time only, you will only pay for the weeks when you are in residence. How do I change my catering? Where you have requested catering then you will receive a daily credit on your Unicard to pay for your meals. To change your catering arrangement please email accommodation@rau.ac.uk. Changes to your catering can only be requested at the end of the term. All bedrooms are fully decorated and furnished to include a single bed, desk, chair, bedside table, wardrobe with some coat hangers, wall mirror, notice board, lamp, kettle, duvets, sheets, pillows and covers, curtains, Wi-Fi connection for PC/laptop (you will need to register all computers upon arrival before you can access the internet). The fully-equiped kitchens in self-catered accommodation includes pots, pans, cutlery and crockery. Heater, electrical cooking items e,g, toaster/sandwich maker, candles, blu tac. The arrival date for accommodation for new students will be the Sunday before Fresher's week. Will I have the internet in my room? Yes, you may access the internet from your computer/laptop with a network cable, or by connecting to the university's Wi-Fi network (providing your anti-virus software is up-to-date). If you’d like to access the Wi-Fi through your smartphone or tablet, you will first need to register the device with IT Services. Yes, if you bring a TV or laptop which you can use to watch TV programmes you must purchase a TV licence (the easiest way being through the TV Licensing website). Can I smoke or vape in my room in halls of residence? No, the university has a smoking ban in all of its buildings, including student residences. Yes. The university has a duty, under fire regulations and for security reasons, to maintain an accurate register of all persons living in residential buildings. So, to allow us to maintain accurate records please register all occasional/overnight guests at the Porters Lodge. Where are the nearest shops to the halls of residence? We have a shop on campus selling stationery, books, food and drink, toiletries, RAU clothing and gifts. It is a 20-minute walk into Cirencester town centre which has a huge variety of shops. Yes, located between Bledisloe Court and Coad Court. This is for use by resident and non-resident students. Yes, bins are available in each hall of residence and there are a variety of recycling bins on the campus. Are university staff available 24 hours a day? Yes, during the normal working week you will have the support of the student support services manager, accommodation officer, tutors and, on published days the university nurse. Out of hours, the Porters Lodge and security staff are contactable. All maintenance and damage issues should be reported to the accommodation help zone or via email. Any damage left unreported will become the responsibility of the resident and you will be charged for it. Do I have to move out of my room for the Christmas and Easter breaks? If you are living in the main building then you will need to move out for the Christmas and Easter break, please make sure you take all of your belongings with you and that you leave your room clean and tidy. If you live in any other accommodation block then you will have access to your room for the full academic year, whether you choose to stay during the Christmas and Easter breaks, or just leave some of your belongings, is up to you. Can I leave my accommodation if I find a house to live in off-campus? If a resident chooses to terminate the contract prior to the contracted date of the agreement (to move to an alternative residence, withdraw from studies, attend a sandwich placement or another reason), then they shall remain liable for all charges associated with the accommodation. A refund of the remainder of the accommodation fee will only be made once a suitable replacement resident is found, who is not already a resident on campus, who meets with the approval of the Accommodation Office. Where do I live after my first year? There is a wealth of privately owned accommodation in Cirencester and the surrounding villages. How do I find private rented accommodation? Please visit Urban Fox to have a look at the properties currently available. Also, talk to current students to find out where they are living and what are the best areas and most accessible to the University and town centre. What if I do not have a car, how do I then get to university? The campus is only a short walk from some of the residential areas of Cirencester. The university runs a shuttle bus service throughout the day running from areas of town to the university.